stacey yacula studio: hello march! is our winter break and usually some warmer days. as for our winter break it is almost upon us. this illustration was inspired by my childhood winters in northern ontario. it has to offer and of course being able to warm up with a hot drink. who gave us many memorable field trips in the snow. very, very sweet and warm memories! amazing, stacey! i adore this! 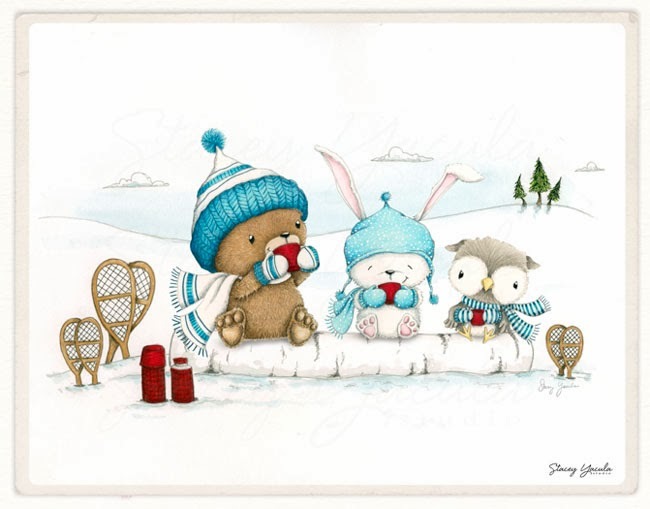 i'm in love with these characters and i too can appreciate a delicious cup of hot cocoa after playing in the snow. you are such an inspiration to me, stacey! thanks for your kindness. melissa! i am so happy you like these little characters. it was a real pleasure to connect with you. please keep in touch! Absolutely ADORABLE!!!!! LOVE your characters and illustrations! Ah, what a sweet picture and so reminiscent of wonderful childhood days! I hope my own kids think back to the many snow days we have had in just the same way! Thank you Karin & Judy for your kind words and I am so glad you both enjoyed my illustration. Judy, I too hope that my own children will have fond memories of all our snowy travels together. As always, this is adorable! I never had snowshoes, but went ice skating every day after school in the winter. We always needed something warm afterward, so your sweet characters remind me of these memories! Thank you! the most darling drawing and coloring ever! Love it Stacy! "beaverphyllis" I also went ice skating too! every school had an outdoor rink. nothing like being outside for those activities! it warms my heart to hear that my illustration can conjure up fond memories for you. Thank you for sharing your memories with me. Pam! thank you for taking the time to write such kind words to me. a lovely way to begin my day! This is so cute! I just found your stamps and illustrations last night. Thank you so much for sharing them. Thank you Heather I am so happy you discovered my work. Enjoy!